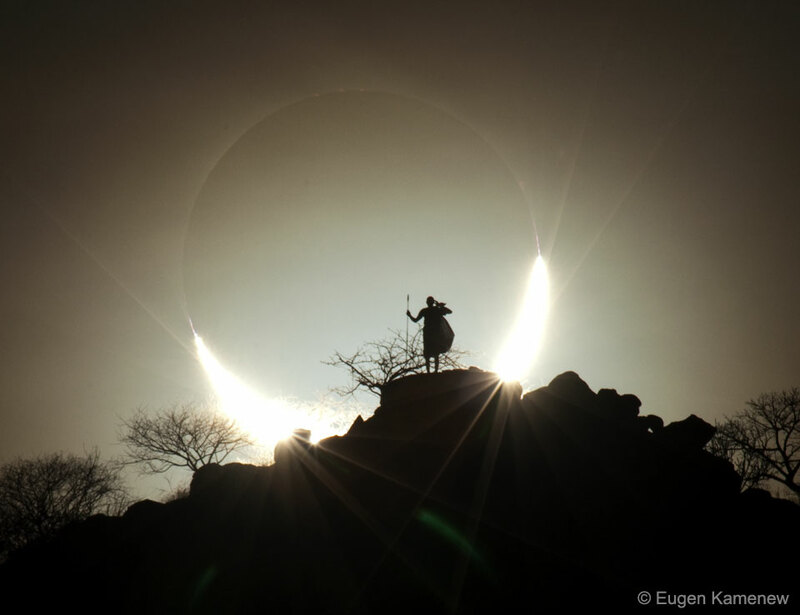 Here you can see a very beautiful image taken in Kenya that shows us a hybrid eclipse, one of the three types of eclipses known so far. And is that, although many do not believe it, depending on the position of the three elements we have three types of eclipses (classified). Explain them in the ones we see between the Sun, the Earth and the Moon. Total eclipse, as its name indicates completely covers the Moon to the Sun, better known as seeing the umbra of the Sun. In this type of eclipse you can not see the Sun but if the light it shows (rays). Annular eclipse, in which the Moon covers only one part of the Sun leaving the other visible. That is to say, there is part of the Moon that covers the Sun and leaves that not being outside of the solar sphere. Hybrid Eclipse, where, if in the total the Moon covers the whole Sun and in the annular, the Moon covers part of the Sun, the hybrid is where the Moon completely covers the Sun, but does not completely cover it, being able to observe Part of this. Exactly as in the post image. Why are there these types of eclipse ?. It’s simple, you just have to think about how Earth is (ideally) a sphere. Therefore, depending on where we find in this respect to the Moon and the Sun the shadow that the Moon projects on the Earth (which is the eclipse), thanks to the curvature of the Earth will cover more or less the Sun. With this We explain the total and annular eclipse but what about the hybrid eclipse? The hybrid eclipse is explained simply by the Moon’s own orbit. The orbit is an ellipse, that is to say, it is not circular, so the distance between the Earth and the Moon varies (between 350 thousand kilometers and 400 thousand kilometers, approximately) and this does “vary” when the Moon covers the Sun. If we are lucky that the Moon is in its outermost zone (perigee) and there is an eclipse we will get a hybrid eclipse. Very simple and logical everything.